Keeper of the Bees has all the makings of a popular YA modern fairy tale—cursed protagonists, magical villains, and a romance for the ages. It has even been described as a retelling of Beauty and the Beast, though personally I find that comparison to be a bit of a stretch, and, to be honest, a disservice to the world of this book, considering how unique it is. The story is told from the perspective of two teens: one who has been wandering the earth since time immemorial, cursed with a hive full of bees in his chest, and the other is from a small town where everyone knows her name, but only because it is said her entire family line is cursed with madness. Dresden, who was born in a faraway place long ago, was eighteen when he was captured by a wicked queen and turned into a monster whose insides crawl with bees that can cause psychosis and violent tendencies when they sting you. With his real visage having been lost to the centuries, his face now is an ever-shifting composite of all the people whom his bees have stung—all dead now because of him. His only consolation is knowing that he goes only where the Harbingers go, since where the crow shifters gather, death and destruction will soon follow. At the very least, his stings will only affect those whose days are numbered anyway. But then came Essie. Dresden ends up following the Harbingers’ trail to a town in Missouri where something bad is about to happen, for the crows are never wrong. There, he meets a girl who can not only see through his shifting features when his magic usually keeps others’ attention off him, she also doesn’t seem to be afraid. In fact, she doesn’t seem at all bothered by what he is, or that a swarm of angry buzzing bees that live inside his chest. But then she confesses that she sees strange things every day, because she is Essie Wickerton, and like many members of her family, she is afflicted with a mysterious condition that makes her suffer hallucinations. She ends up being quite surprised that Dresden is real. A special bond forms between them, which eventually deepens into something more. But Dresden, who doesn’t always feel in control of his bees, fears he will bring harm to the first person he has ever loved since becoming a beekeeper, and Essie, whose condition is worsening by the day, knows that she is one wrong move away from being committed involuntarily into a psychiatric hospital. Meanwhile, there is a ruthless killer in town, creating panic in this once peaceful community, and as the Harbingers warn, a big disaster is still looming on the horizon. Keeper of the Bees is the second novel of the Black Birds of the Gallows sequence, though I was happy to learn it stands alone because I have not yet read the first one. This book takes place in a new setting and follows new characters, with Meg Kassel providing newcomers with a great rundown of her lush and imaginative world so you can slip right in without feeling like you missed a beat. As a matter of fact, the incredible world-building was the first thing that caught my attention. After all, how can you read the author’s concept of “beekeepers” and not be intrigued? The idea of a supernatural being with a hive of bees in the hollowed-out cavity where his insides use to be is pretty grotesque…but also fascinating. And we haven’t even gotten to the best part. The sting of a beekeeper’s bees contain venom that can trigger the dark instincts of already broken individuals, causing them to kill themselves or others. This effect often goes hand in hand with the Harbingers, who are also former subjects of the twisted reign that created all these magical beings. They can never truly die, and instead they are resurrected into crows, a form that they will live in for a time before assuming their human shape again, but as children. Then they grow, and the cycle starts over, forever trapping the poor soul in this cruel limbo. The Harbingers harvest the energies of the dying, so wherever you find Dresden, there is usually also one or two of these crow-shifters around, feeding off the mayhem left by his bee sting victims. All this is just scratching the surface. There are also the Strawmen, watchers of immense power that strike fear into the hearts of both Harbingers and beekeepers. They are just one example of the many things in this book that I wish we had more time to explore, but as you can see, there is a lot of potential here and simply too much of the “weird and wonderful” to cover. That is why on some level, I think the blurb likening this book to Beauty and the Beast was unnecessary, and even hurts it to some extent, because being so strongly associated with a known fairy tale like that inevitably creates expectations, when the reality is that Keeper of the Bees can stand on its own without the help of any preconceptions. Its world is just SO unique, truly unlike anything I’ve ever seen before. That said, the world-building was perhaps this novel’s greatest strength, and thank goodness for that, because it was probably the one thing that helped bolster my interest in the admittedly humdrum YA romance plot. The only reason I’m not blasting it right now for insta-love is because there was so much else going on in the world-building which effectively masked the fact that Dresden and Essie barely knew each other before advancing to the “I’ll move worlds for you” stage in their relationship. Still, the insta-love was there, just not as obvious in this case. Other aspects of the plot were also pretty predictable, and cliched. Essie herself felt like a throwback to the classic fantasy damsels-in-distress who needed to be saved, and that bothered me a lot more than I thought it would. On the one hand, I applaud Kassel for attempting to create such an interesting female protagonist, but on the other, in making Essie’s condition so debilitating, the author might have gone a little overboard with it and made her character too helpless. 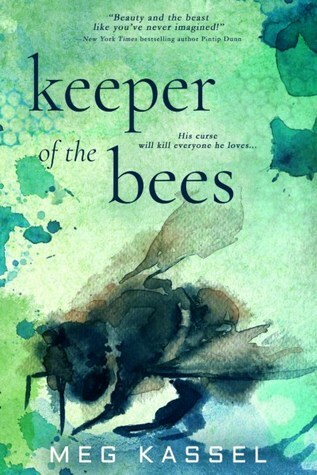 All told, Keeper of the Bees is a novel with incredible strengths in some areas, and disappointments in others. The pros include an amazingly complex world full of strange and darkly whimsical creatures and magic, brought to life by Meg Kassel’s rich prose. The superb world-building and the unique ideas found here are probably worth the price of admission alone. However, there are also the cons, with the hokey YA love story and archetypal characters making up the worst of it, though thankfully many of their negative effects are offset by the book’s strengths. I would still happily read more by the author, especially more of this series, if it means seeing more of her stunning world-building at work. Yes, everything you said. I was mostly bothered by Essie and her inability to make any decisions for herself, but the world building was so unique it made up for the shortcomings. I think the first book focuses on the Harbingers, which would be fun to read about! Yeah, she seemed pretty helpless…like literally. I know it’s because of her condition, but it bothered me a little that she wasn’t in control of any part of her life and needed rescuing all the time! And yes, the first book is about harbingers, I believe. And the two characters in Philly that Dresden met were the protagonists. I keep hearing mixed reviews on this one and I’m not sure whether to add it to my TBR or not! Loved seeing your thoughts on this one though. I don’t mind insta-love sometimes, but other times I just have to roll my eyes. Same here. I will say this is not the worst book when it comes to insta-love, but it was definitely there. Oh right, the bees book! The bees! The bees! I’m curious about this book, but heard many different opinions on it. Yeah, the opinions on it are quite mixed. It wasn’t without its flaws, but I still enjoyed it a lot though! This sounds like a good choice for my library-rentals list. Between the insta-love and other elements that you didn’t care for so much, I know I might have a similar reaction and might regret buying the book after the fact. But if I borrow it from the library, then I’d still give myself the chance to check it out but without the guilt-in-hindsight factor. I just want to experience that worldbuilding for myself! I’m on the fence with this one. I can’t make my mind up whether or not to read it so will probably give it a miss.